Happy Malaysia Day! I hope September has been treating you well so far. I’m definitely having a lot of fun! To the point I haven’t even had the chance to do any exciting dishes. So those of you who have come to this blog from “The Star” article, I’m going to do this space justice by posting an unique recipe today from Sarawak. 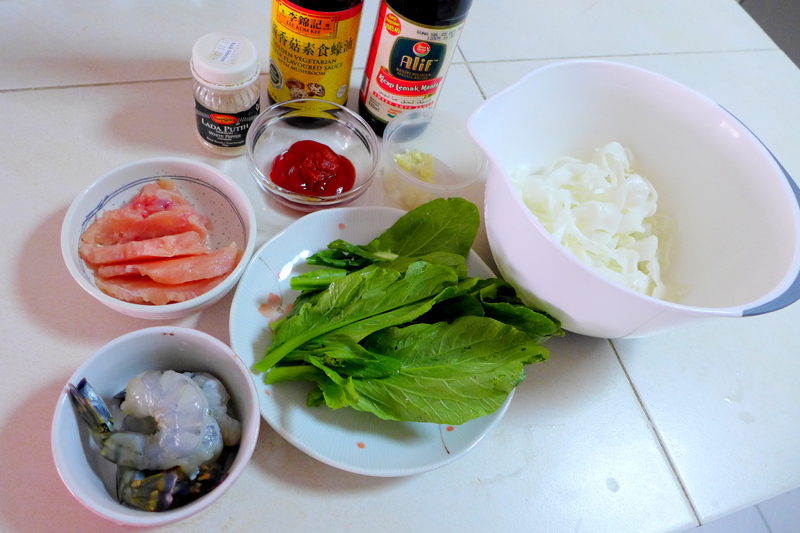 The toppings varies from stall to stall but the basic would be some seafood (Prawns and squid usually, sometimes fish cake), vegetables (Choy Sum and sometimes Carrot too), and meat (Pork or Chicken). Having said that though, you probably won’t get prawns as big as these ones. Ahh…… that’s the beauty of home-cooking! The process is rather simple, and I have referred to the recipe by Kimba’s Kitchen and adapted to my own taste. Mise en place, but missing some cornstarch and chicken stock. 4 Prawns (of any variety, I used large tiger prawns), de-shelled and de-veined. Loosen the Kueh Tiaw and fry them in high heat with a little oil, adding Sweet Soy Sauce as you go until evenly coated. Don’t overcook as they will become sticky and clumpy. Smelling pretty good at this point, and it’s just noodles! 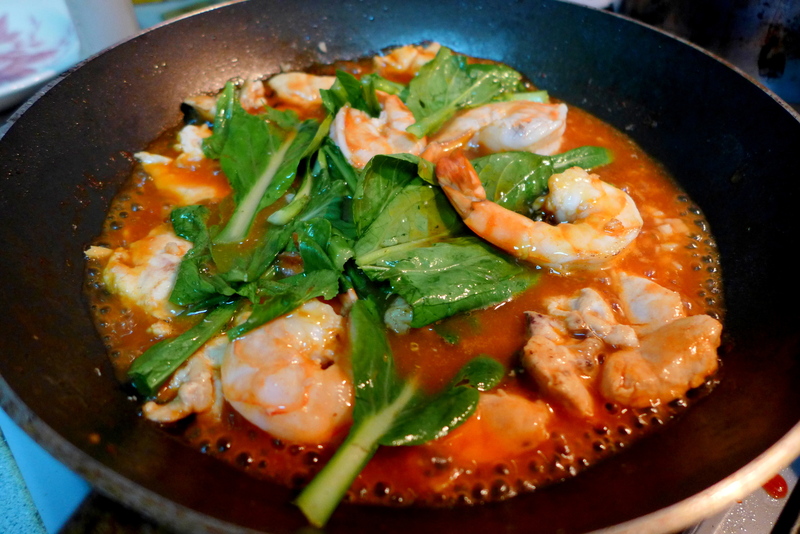 Using the same pan, add a little more oil and saute garlic with chicken, follow by prawns. 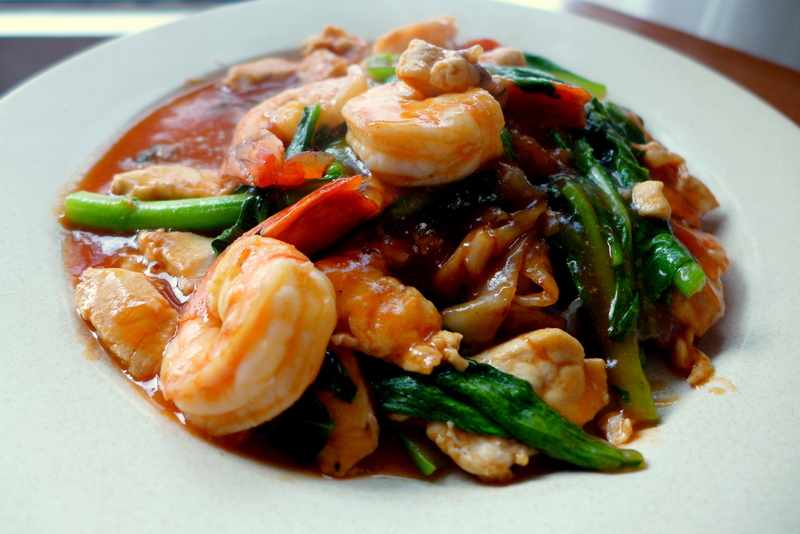 When the prawns and chicken are seared on both sides, pour in the chicken stock, followed by tomato sauce and puree, and oyster sauce. Bring sauce to boil and add Choy sum. Thicken with cornstarch and simmer for another minute or two until everything is cooked. Bubbling away and loving the colours! Once you are happy with the sauce (might need to adjust with more water), turn off heat and pour the sauce over the Kueh Tiaw. Finish with some white pepper (and chili if you wish) and serve immediately. Mmmm….. Perfection on a plate. It’s amazing how such simple dish can be so delicious. Savoury sweet soft noodles, piping hot sauce to bring that piquancy, with plenty of juicy prawns, tender chicken (secret is not to overcook chicken breast, always), crunchy vegetables. That made me a very happy girl! In fact I think I might cook another plate later. Oh… will you look at that?! So have you ever tried Tomato Kueh Tiaw before? What do you think of the taste? A lot of places in Bintulu don’t do this dish right. We only go to a couple of places for this. Most of the time not tangy enough, or too sweet! Sarawak tomato noodles are Cumi and my favourite! LOL… looks delish! Top of the list wor when I search strawberry cafe. I LOVE everything with tomato in it! Thanks!! I would try this! Oooh, then you’ll like this dish! First had this in Kuching way back in the 70’s – I like the lighter tomato gravy and I still prefer those at some selected places there – I’ve tried the ones we have here in Sibu. They’re nice too but I’ve yet to find one that comes close. Same problem in Bintulu, only a couple of places do decent ones. 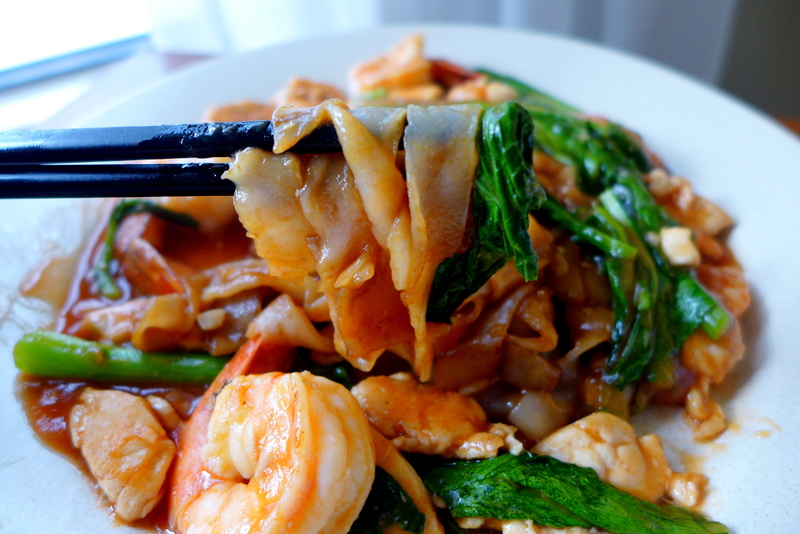 tomato koay teow.. something new.. looks good.. going to try it out. hi kelly, coming over from FB. 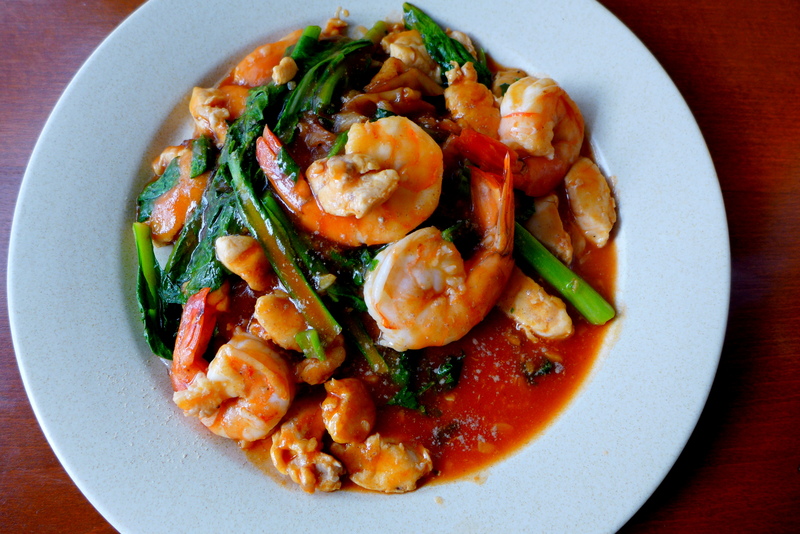 I remember seeing a few of them cooked this dish during the sarawak MFF last year…looks absolutely delish! Let me chk out that star article, missed that but i happened to see your winning entry in that hashbrown competition in a magazine. Congrats! The star article is a click away! 🙂 Yeah few ladies did this dish last year. Don’t know why I didn’t cook it but good la, now I did it for Malayisa day. never had this before, but it does look very good! Yeah I much refer this gravy to 滑蛋河 with the tomato tang. 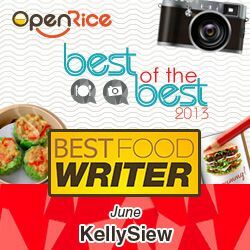 Kelly, you have been unfair to its sister, tomato mee! That is actually more unique than tomato kway tiao due to its crispy nature. By the way, your look yummy with enough tomato sauce. Cheers to tomato noodles. Like I said it’s to do with preference, never liked the crispy version but my sister prefer that one. I stated it very clearly in my post that you can have both versions. BTW, as not many bloggers blogged about this noodles. I will share your post in Facebook to let more foodies aware of this noodles dish..
A few bloggers posted the recipe during the Sarawak month of Malaysian Food Fest. Some did noodles and some did Kueh Tiaw. But i believe it is not as authentic as a Sarawakian who blogged about it. Shared and I started to see foodies liking your post! good night. Oh btw I don’t think they are sisters, just the same dish with different variations, just like Kampua can be eaten with mee pok, and I prefer the mee pok version. Something about flat noodles that works better for me. The crispy thing is done by the Cantonese too with their watan hor. Looks good and I could feel the “Wok Hei” form the Hor Fun pic! Lol not surprised if it was inspired by pasta. I cranked my heat to the highest possible….. A bit of wok hei, not bad! Ooh. The manicai and egg dish is so yummy! I will never get sick of it. So give this one a try! Have to cook the kueh tiaw on high heat and fast, otherwise will be sticky. Ohh….thanks for the note. But nothing wrong with the type of kuey teow rite? Could be too. You need to get the type that’s suitable for frying. Don’t soak or wash it. Oooh do make it soon. It’s actually quite simple and you can always customise your toppings. Babe, my first attempt didnt turn out as it is. I followed your recipe but the gravy was a bit dry…. :( and the kway teow was soggy, thinking i prolly got the wrong kway teow? 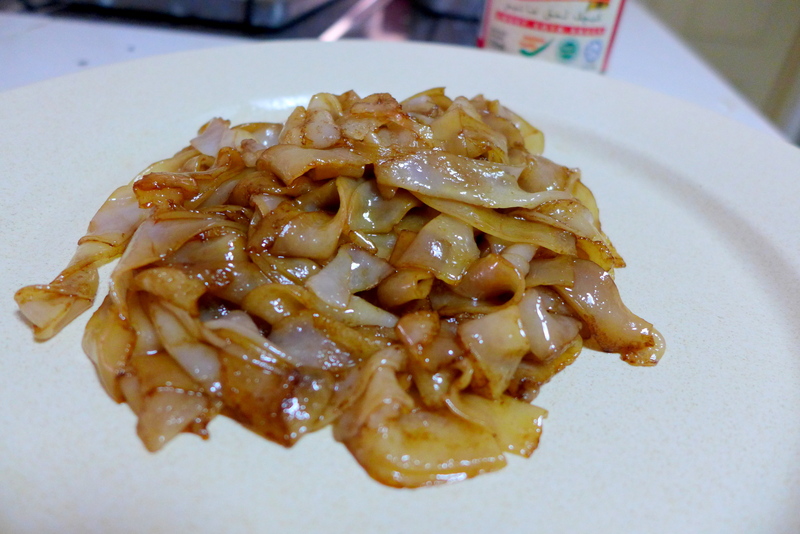 I’m not a fan of kueh tiaw so I use mee instead… and it works! I’ll try egg noodles next time. Thanks for this recipe! Much love from the Philippines. Great! Yes you can definitely use different type of noodles. In Sarawak sometimes they deep fry the egg noodles so it’s super crispy with the sauce pour over.